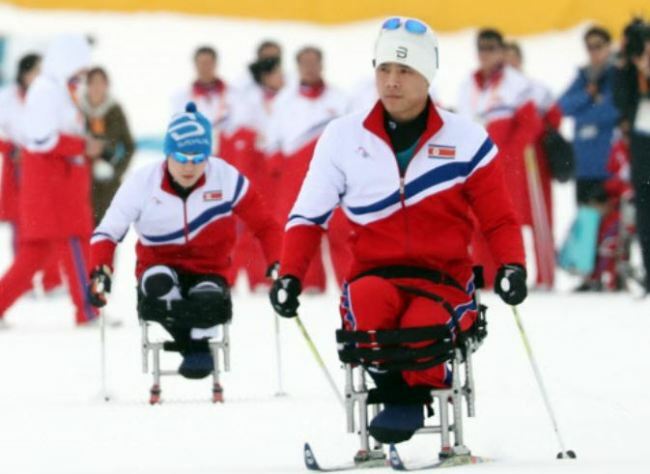 Sin, 37, is considered one of South Korea's top medal contenders at the PyeongChang Paralympics. He will compete in both cross-country skiing and biathlon events. Kim, 17, is one of the two North Koreans who will compete in PyeongChang. The other is Ma Yu-chol. The two sit skiers will compete in cross-country skiing events after receiving special invitation from the International Paralympic Committee. South Korea will have its athletes' parade last among 49 participating countries as the host country, while North Korea, making its Winter Paralympics debut, will march 34th in order behind Japan. The two Koreas originally planned to have a joint march under the Korean Unification Flag, as they did at the opening ceremony of the Winter Olympic Games on Feb. 9. But following discussions on Thursday, they decided to march separately after both sides failed to narrow differences over the flag. The North wanted to march behind a Korean Unification Flag showing Dokdo -- the eastern islets of South Korea that Japan falsely claims as its own territory -- while the South wanted to have the flag without Dokdo to respect the IPC's recommendation not to politicize sports events. IPC President Andrew Parsons said that the IPC is disappointed, but respects the decisions of the two Koreas.